The Kärcher K 5 Premium Full Control Plus Home includes our latest cleaning innovation - a single multijet lance that enables you to adjust the pressure to suit any cleaning task. K 5 Premium Full Control Plus Home 13246350 https://www.kaercher.com/ie/home-garden/pressure-washers/k-5-premium-full-control-plus-home-13246350.html The Kärcher K 5 Premium Full Control Plus Home includes our latest cleaning innovation - a single multijet lance that enables you to adjust the pressure to suit any cleaning task. The Kärcher K 5 Premium Full Control Plus Home pressure washer has all the outdoor cleaning power you need, including our latest cleaning innovation - a 3-in-1 Multijet lance that can be adjusted between vario lance, dirt blaster and detergent settings. Within each power mode you can easily adjust the pressure using the simple buttons on the LCD display touch control trigger gun. 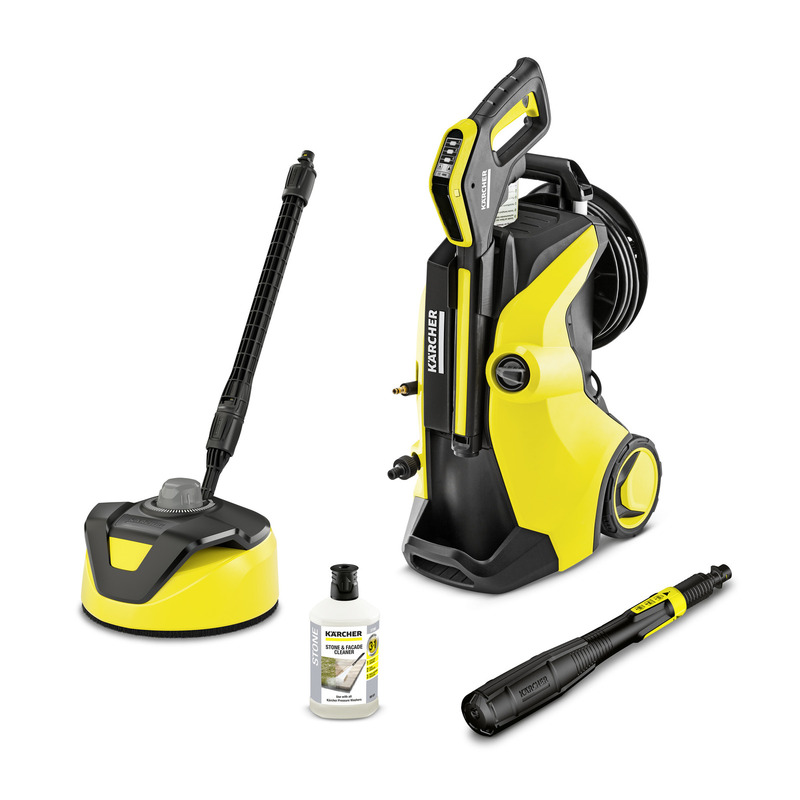 This machine comes with the on board storage for all your other accessories, including a hose reel to store the high pressure hose, this 8 m hose gives you lots of reach, making cleaning tasks simple and easy. The Plug and Clean detergent system on board makes applying and switching detergents mess-free and easy. The additional home kit includes the following accessories: T350 patio cleaner and a 1 L bottle of stone and facade detergent, this makes tackling even the toughest of dirt on patios, decking, fencing, walls, wheelie bins and cars easy. The state-of-the-art water-cooled motor gives extra durability and outstanding performance, backed by a Kärcher 5 year warranty. K 5 Premium Full Control Plus Home is rated 4.8 out of 5 by 35. Rated 3 out of 5 by ROX1 from Great pressure washer, car wash over promise Hi The pressure washer element is superb and easy to use but the car washing aspect (liquid) is expensive and doesn't deliver. You still need a bucket and sponge or it dries with a film all over the car. Rated 5 out of 5 by Evojeff from Perfect It's worth the extra expense, as this is ideal.in every way. Rated 5 out of 5 by Thed00n from Fantastic product with lots of great features Power washer tickets all the boxes, can be used for cars, Windows, driveway, patio. Love the ability to increase/reduce the pressure at the click of a button. Patio and car have never looked so clean!